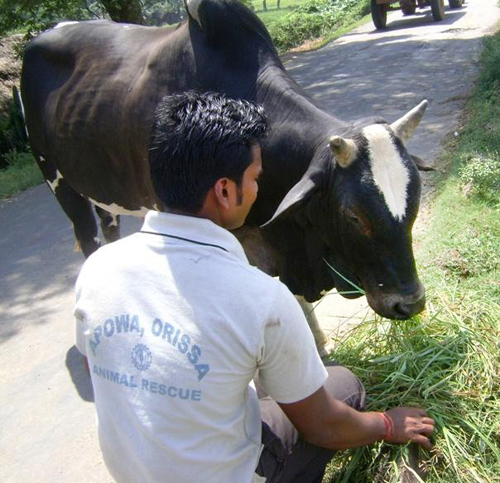 A stray bull being fed by Mr. Mantu Das, a volunteer with our disaster response team. 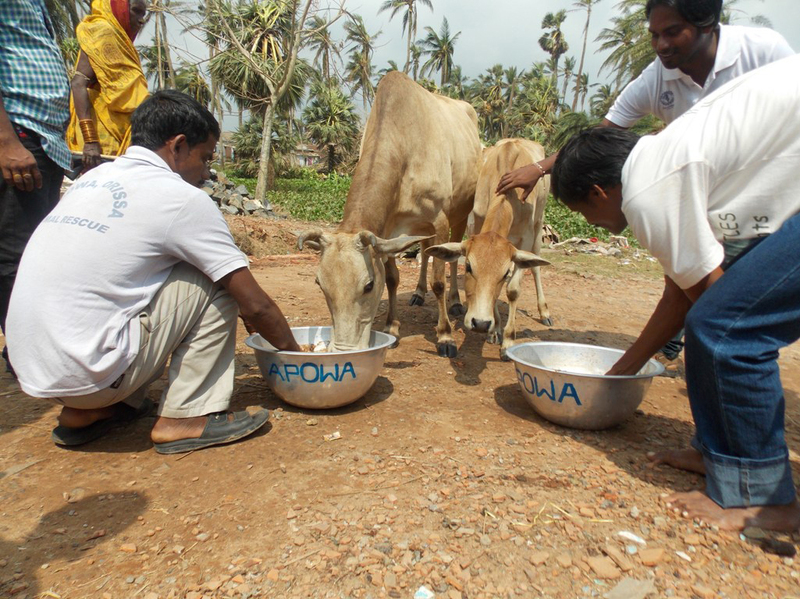 APOWA has been providing relief to animals in cyclone- and flood-affected villages of Odisha, India. Phailin left a trail of destruction. According to the report of the Animal Resource Development Department, Government of Odisha, over seven million animals were adversely affected. The cyclone, attaining a windspeed of 220 kilometers per hour (136 miles per hour) killed 1,500 large animals, 3,000 small animals and 600,000 birds. Recent heavy rains, due to another low pressure system that formed over the Bay of Bengal on the Odisha coast, have worsened the suffering of Phailin victims. A continuous downpour has made life precarious and painful in the affected areas. Since the cyclone struck, APOWA’s disaster response team has been conducting rescue and relief work on the basis of a war footing. We’ve been helped by five animal caretakers who feed neighborhood dogs and an honorary animal welfare officer, certified by the Animal Welfare Board of India. Our Kindness vehicle has been traveling from village to village in the affected areas, offering much-needed assistance and providing vital resources to the animals in distress. Our team of one veterinarian, three paravets (vet techs), and 14 volunteers has been on the go tirelessly, treating animals and providing emergency feeding. 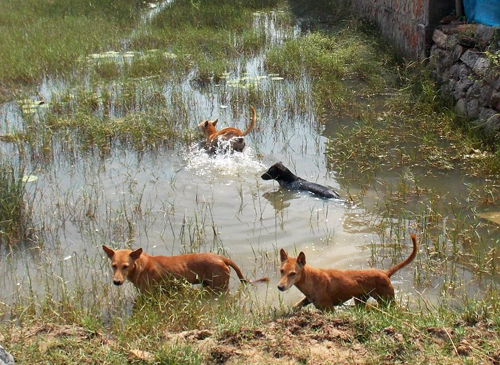 Mr. Bijaya, of APOWA, with neighborhood dogs in Singhagaon village. Our team spent a whole day at Singhagaon village, where a great many animals – neighborhood dogs, stray bulls, cats, and buffaloes were suffering from injury, hunger, dehydration, fever, and coughs. Some kind volunteers from the community joined our team and pitched in, helping to feed the dogs, cats, and cows. 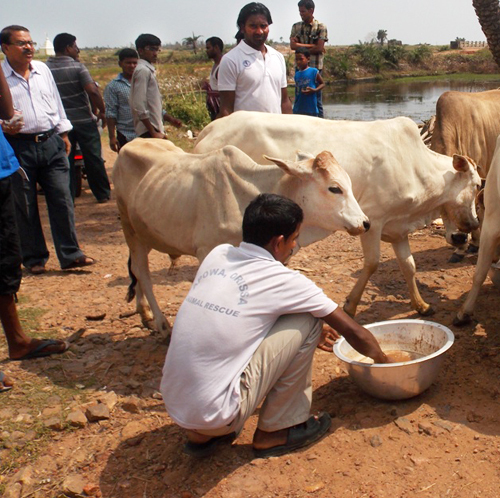 Our team provided treatment and feeding to 68 animals in the village. Mr. Mantu Das feeding hungry cows in affected areas. It’s been a full week since we started providing relief to the surviving animals of the cyclone and flooding. Today, we rushed to Bishnupur village, where we treated and gave food to 54 animals. Today our team treated and fed 71 animals at Berhampur village of Pattamundai block. A team from Humane Society International (HSI) Asia headed by Soham Mukherjee and two veterinarians joined our team at Kantiagarh and Laxmipur village of Ganjam District. There 133 animals were treated and emergency feeding provided. 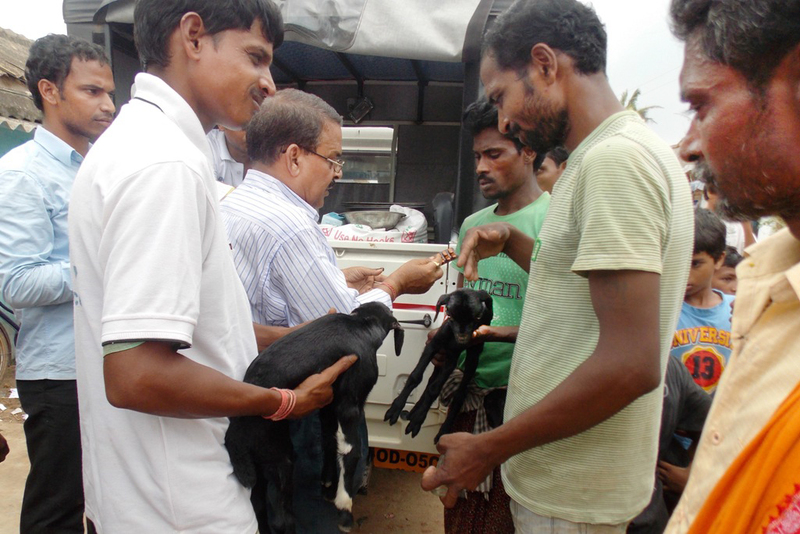 Two volunteers brought two baby goats to Dr. Laxman Behera for treatment. We continue our lifesaving work for animals and our rescue and relief efforts. Our team moved to Kusumi village of Aul block, which had been cut off, entirely surrounded by rivers and severely affected by both the cyclone and the floods. There 83 animals were treated and 52 animals were given food. 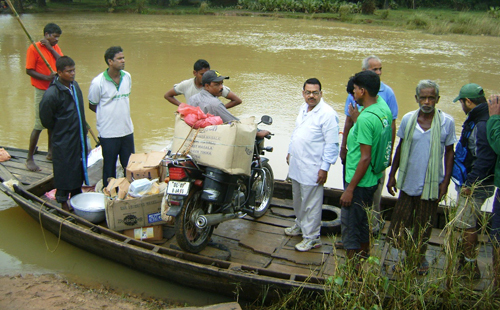 Our disaster response team traveled by boat to reach cyclone and flood victims. Our priority in this disaster is to aid homeless, stray animals who need emergency vet care and food. 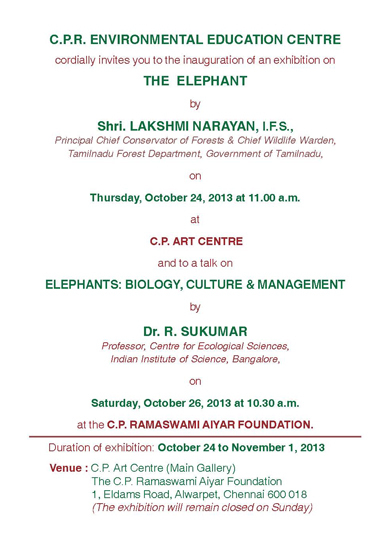 At the same time, we are continuing our regular work helping other animals. Without proper electricity and no drinking water, food procurement is a big problem faced by our team. Despite the difficulty, we’re doing everything possible to get food and treatment to the animals. Because of our love for the animals, we will continue to stay here, working on their behalf until the situation improves. We are grateful to all of our supporters, well-wishers, and to the district administration for their timely cooperation in our work for the animals in the aftermath of cyclone Phailin. 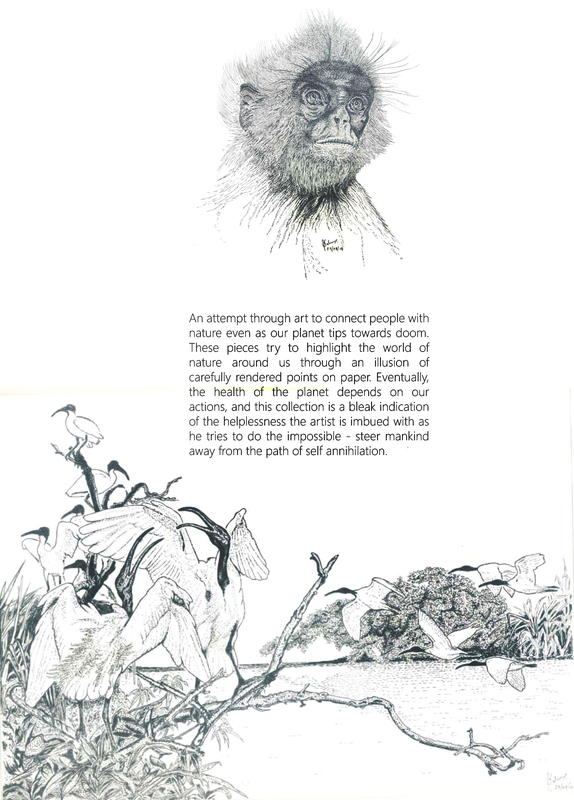 To visit the website of APOWA, click here. 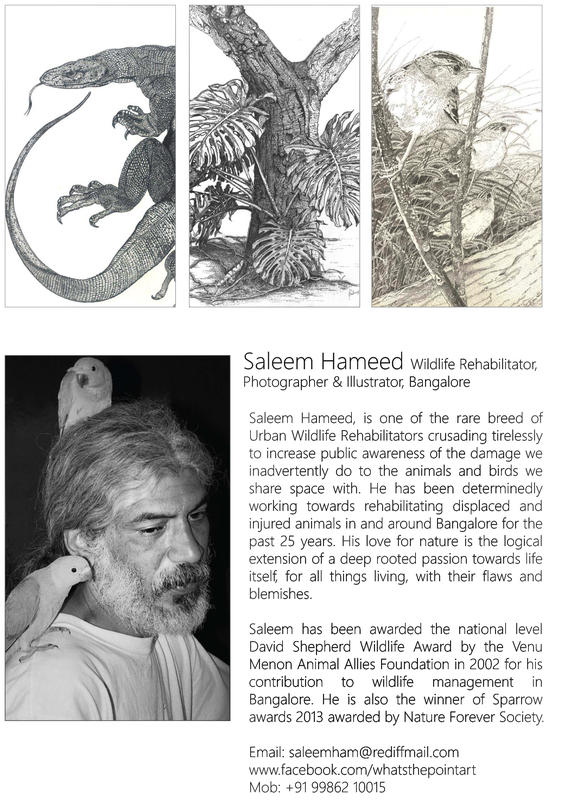 For an easy way to donate, via Help Animals India, click here. Many groups have been very hard at work, in the midst of ongoing floods, rescuing, feeding and providing vet care to animals following cyclone Phailin. 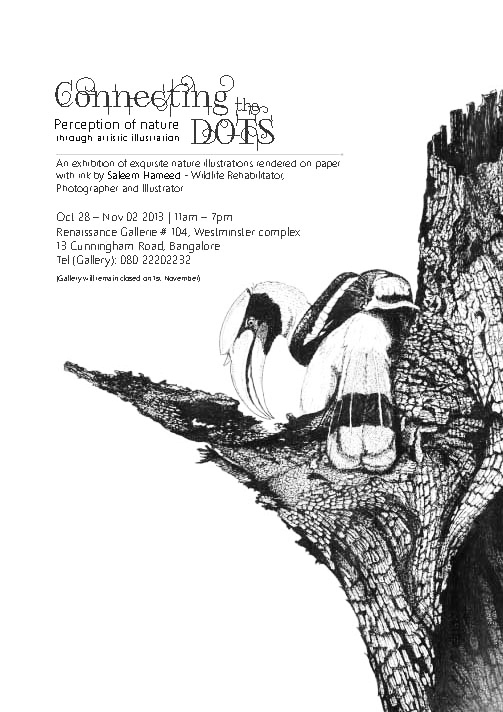 Among them is The Maitri Club. Due to the cyclone and power cuts, Kailash Ch Maharana, Chairman of the Maitri Club, writes that it has been impossible for him, until now, to receive or send emails. They are located in the District of Ganjam, 30 kilometers (18 miles) away from Gopalpur, where cyclone Phailin stuck the sea coast of Orissa, India. On October 12, just before the storm struck, they safely evacuated all the cattle from 13 villages. The cattle are still feeling unsettled and greatly stressed. in Pallibandha village of Ganjam district. 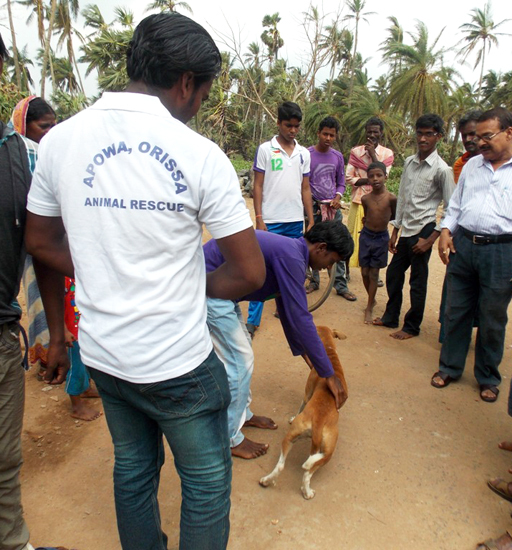 APOWA’s Disaster Response team is working to help the animal survivors of the devastating cyclone and flood in Odisha. Our team has been working relentlessly since the cyclone ‘Phailin’ hit the Odisha coast on October 12, 2013. The footprint of the cyclone is huge and immeasurable. One of our teams, headed by Dr. Laxman Behera, reached Pallibandha in the Ganjam block of Ganjam district, a village with a mostly homeless dog and feral cat population, already struggling to survive before the cyclone. We helped 64 distressed animals by providing food, water, and treatment. 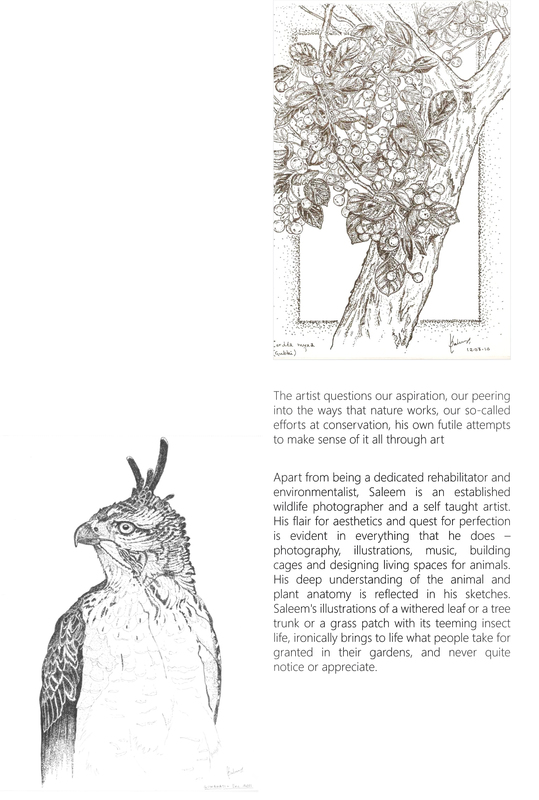 APOWA is a non-profit organisation that mobilizes volunteers and resources for animal victims. 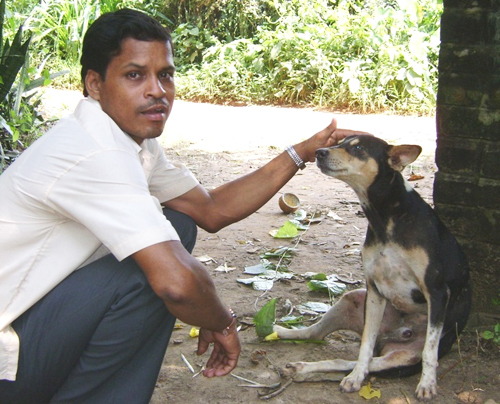 A volunteer helps an injured stray dog, about to be treated by APOWA’s vet doctor, Dr. Laxman Behera, at Pallibandha village in Ganjam district. Injury and disease are always common following a severe cyclone, whenever saltwater pours into a seaside village. Our team rushed to Purunabandha, a seaside village in Ganjam district, severely affected by the cyclone. Mr. Bichitra Biswal and Mr. Sukumar Parida, along with two other volunteers, gave emergency feeding to stray dogs, cats, and cattle. Meanwhile, Mr. Subhajyoti Panda and Mr. Rabindra Sahoo assisted Dr. Behera with the treatment of animals. 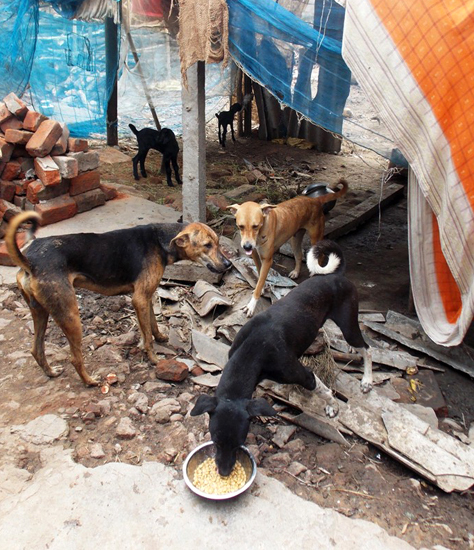 59 animals were treated by the team in this village. Mr. Sukumar Parida, one of APOWA’s disaster response team members, caring for a surviving cat at Purunabandha village in Ganjam district. 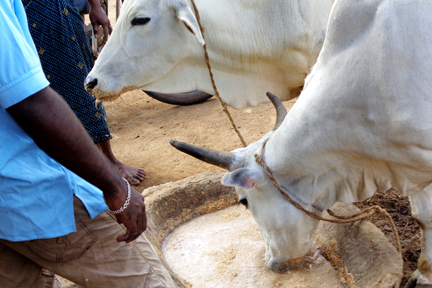 We bring food to many cattle roaming in cyclone-affected areas. 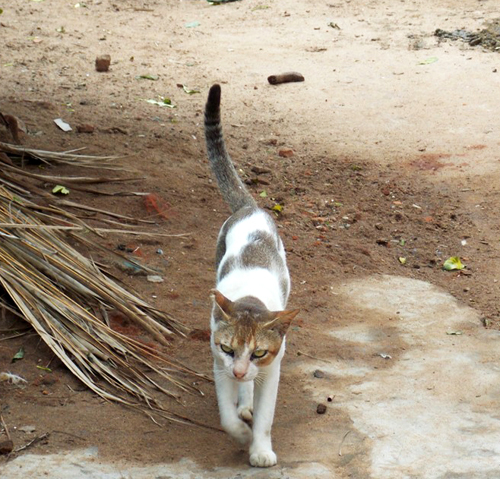 A surviving feral cat walks along a street in Purunabandha village. It was another long working day for our team at Binchanapalli in the Palibandha Panchayat of the Ganjam block of Ganjam district. Our work is saving lives through emergency feeding and treatment efforts; we’re giving the most vulnerable animals a chance to get back on their feet in this emergency situation. Over 83 animals have been treated for fevers, coughs, and injuries. These rescued dogs are so happy to eat, they have no problem sharing their food. parts of Ganjam district. One of our volunteers is providing emergency feeding. 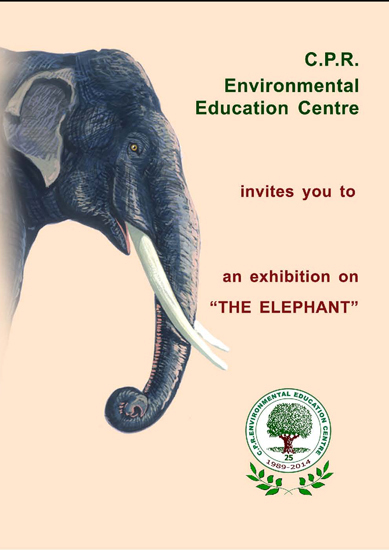 After the cyclone moved along the Odisha coast on October 12, 2013, it left both people and animals feeling insecure and unsettled. Because of our past disaster response experience, we now have in place dedication and commitment to hard work, and an understanding of what is needed to deal with the situation. Combined with our genuine love for the animals, our teams will be in place until the situation improves. There is still flooding and anguish in most villages. People’s frustration is running high in affected areas. 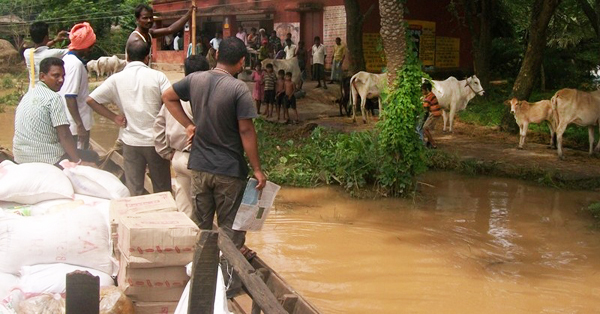 For more information or to help APOWA’s flood relief work with a donation, visit the website of Help Animals India. The fierce winds of cyclone Phaillin blew away the outside extension roof of APOWA’s animal shelter, though the rest of the shelter is okay. Cyclone Phaillin was the strongest cyclone to hit India in 14 years, and it caused widespread damage. Nearly a million people were evacuated before the storm hit, which saved a great many lives, and the human death toll was low. However, many homes were lost; there are many displaced pets, and farm animals are left without a source of food, since pastures are covered in water and food supplies were drenched by the storm. At APOWA’s shelter, they are coping with an influx of new animals, brought to them when people in the nearby villages, Poipat and Ghigidia, rushed to take cover from the storm in their shelter. 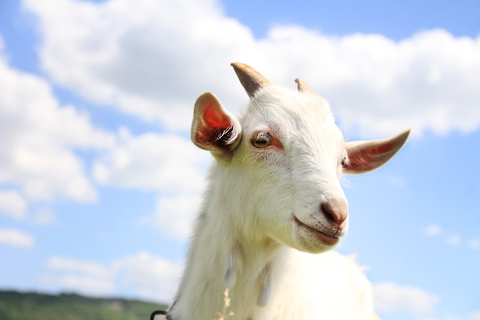 There are now 48 animals, both large and small, being cared for at the shelter. APOWA has sent a team of rescuers to the worst-hit areas nearby in the Kendrapara district. The team is providing vet care, food and medicine to animals stranded in the floods. The electricity is still out most of the time, and the flood relief team has not yet been able to send back reports or photos. 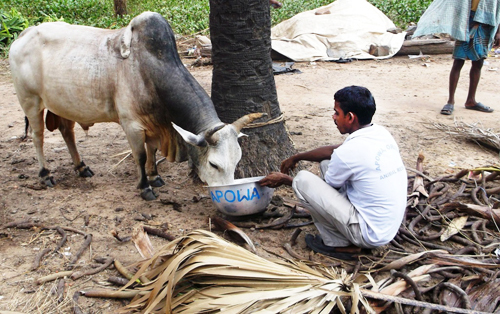 The images above are of the work that APOWA did in 2011, following another cyclone, in which they provided much-needed food and vet care to thousands of cows whose pastures were covered in floodwaters and rescued many pets who were left homeless.